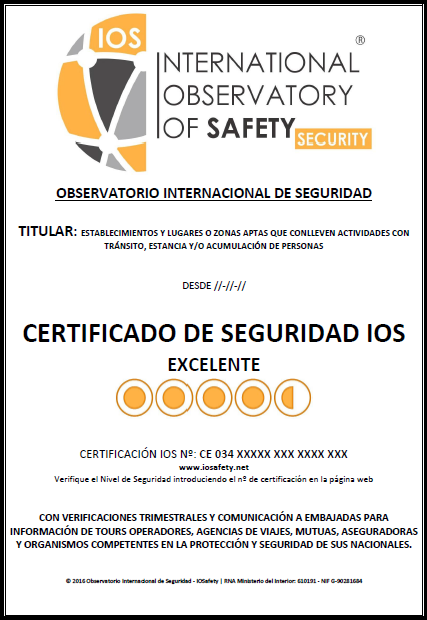 The holder of the IOS Security Certificate has the option to include it in those corporate media that he considers most appropriate, for which, and due to the implication in the degree of responsibility and commitment that this implies for the IOS, serious realization is essential and professional quarterly verification of security maintenance, which are carried out by IOS Official Organization. This includes the advice for the improvement of security and therefore having the option of achieving a better level of security in the Certificate. These quarterly verifications of security maintenance will result in a report in view of which, after deliberation by the Permanent Advisory Commission, the IOS will keep the Security Certificate at the same level, upload it, download it or even withdraw it if the establishment or place submerged in a total abandonment in matters of security, this being a guarantee of the seriousness and prestige of it. The Permanent Advisory Commission, the highest decision-making body, will argue the decision adopted on the IOS Security Certificate. More detailed information subject to Prior Study and RFI (Request for Information). Responsible for the personal data: COSERIMA S.L.